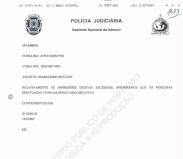 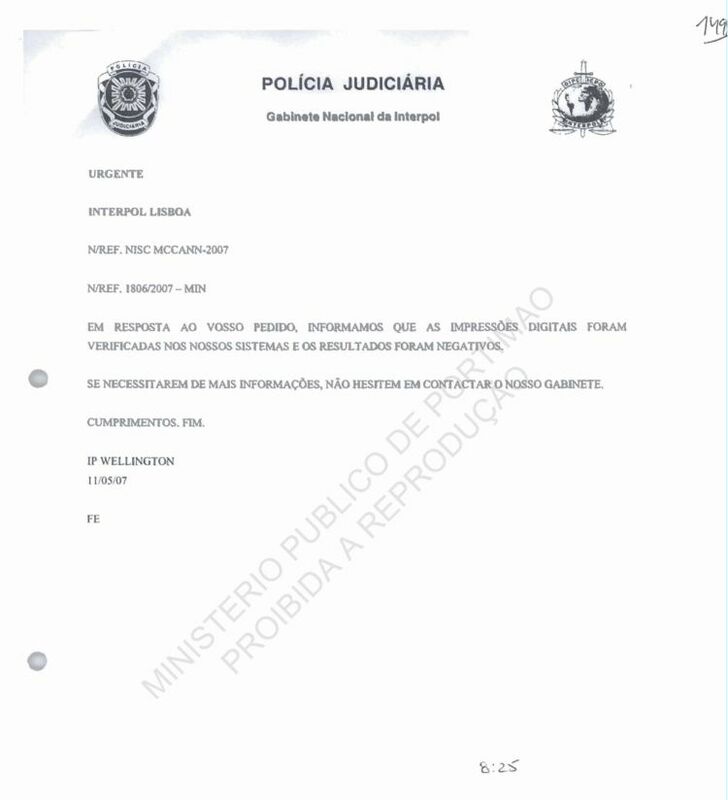 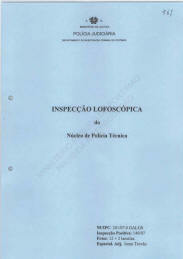 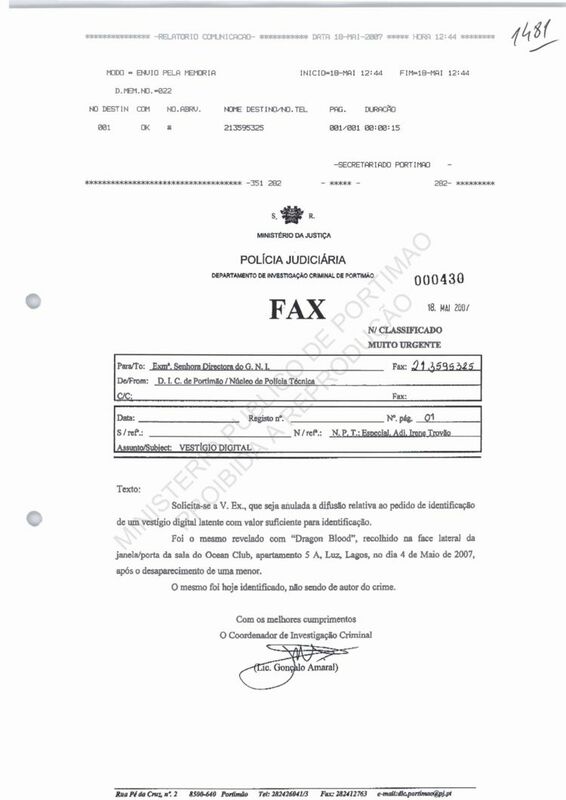 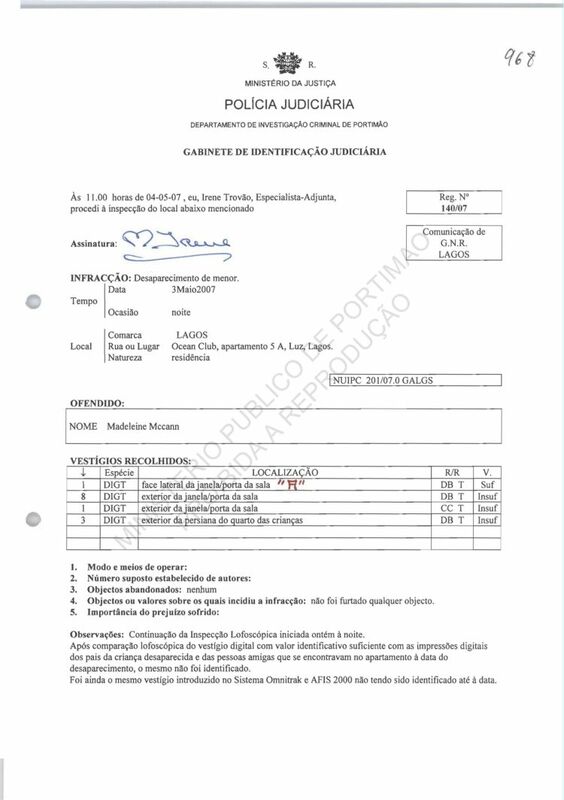 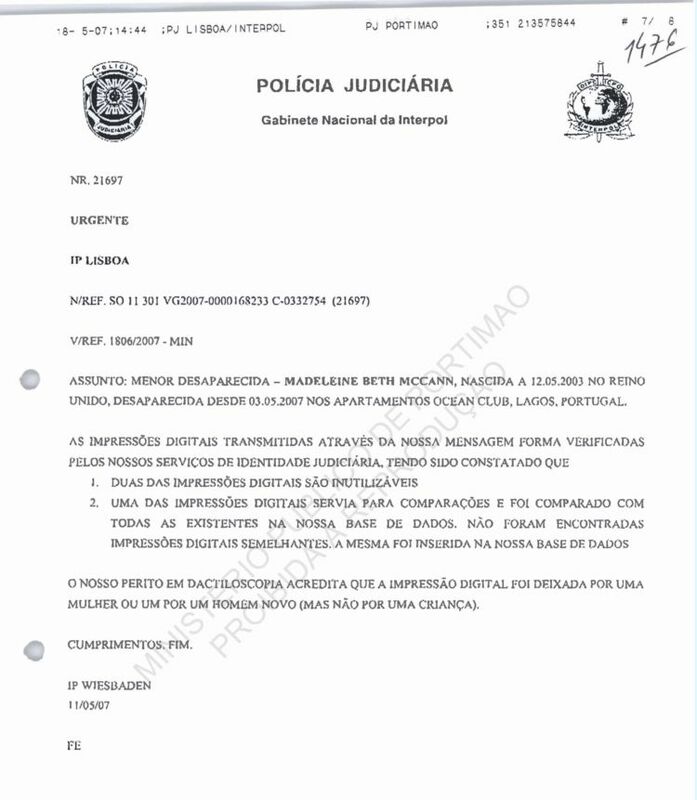 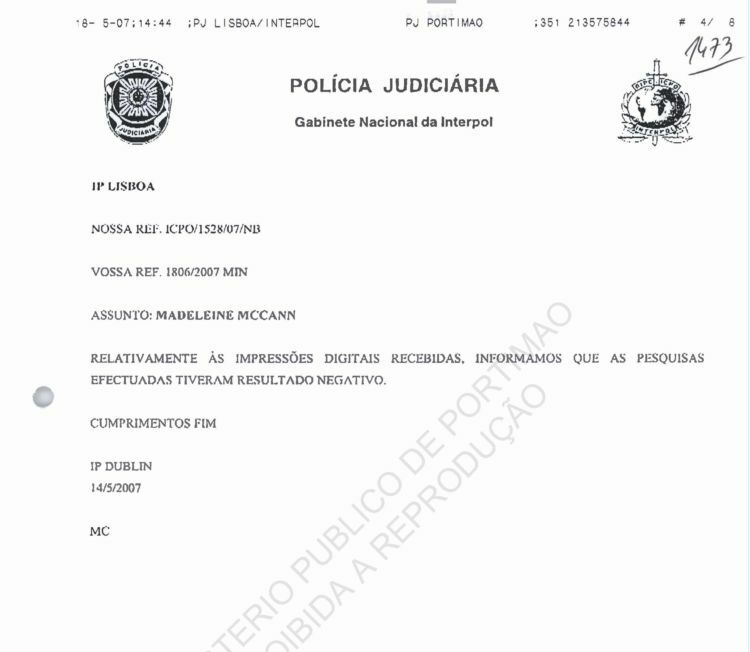 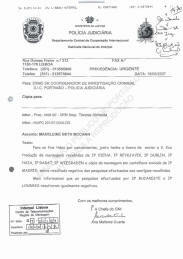 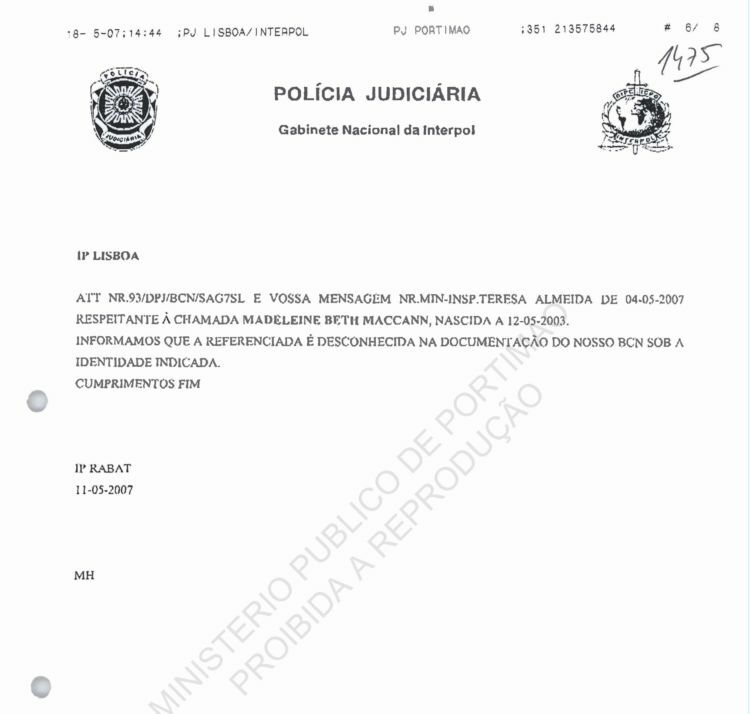 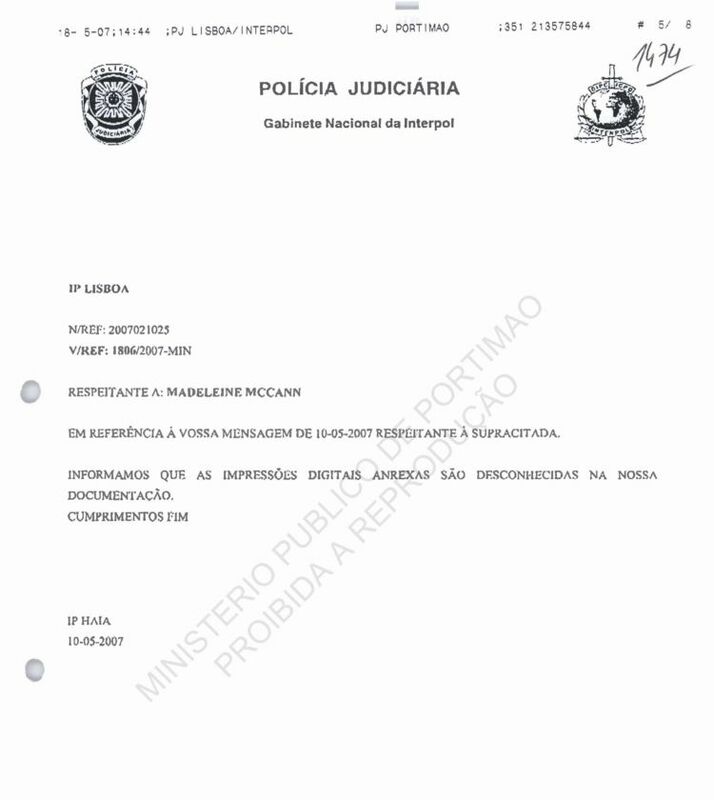 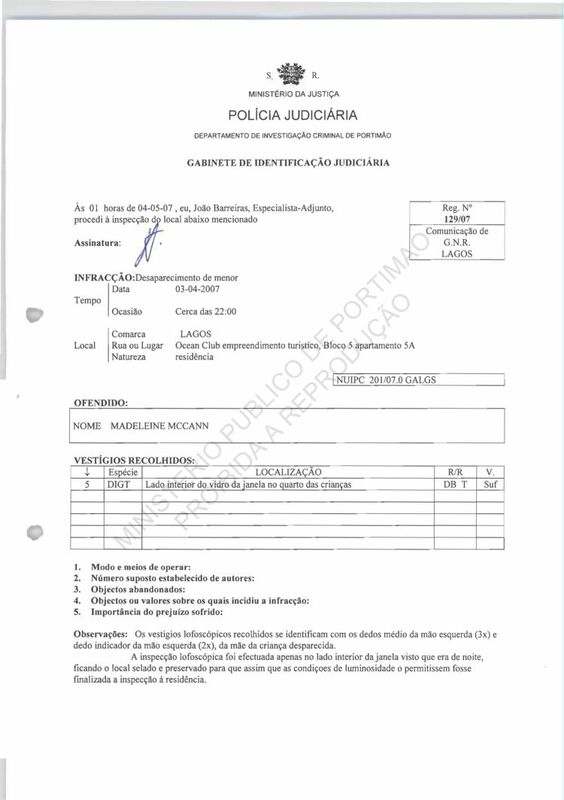 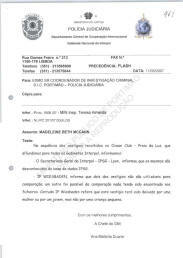 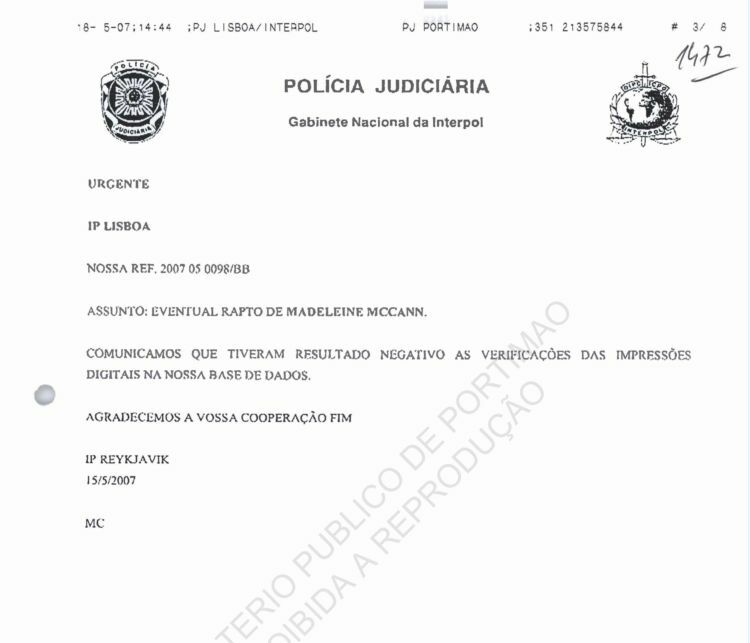 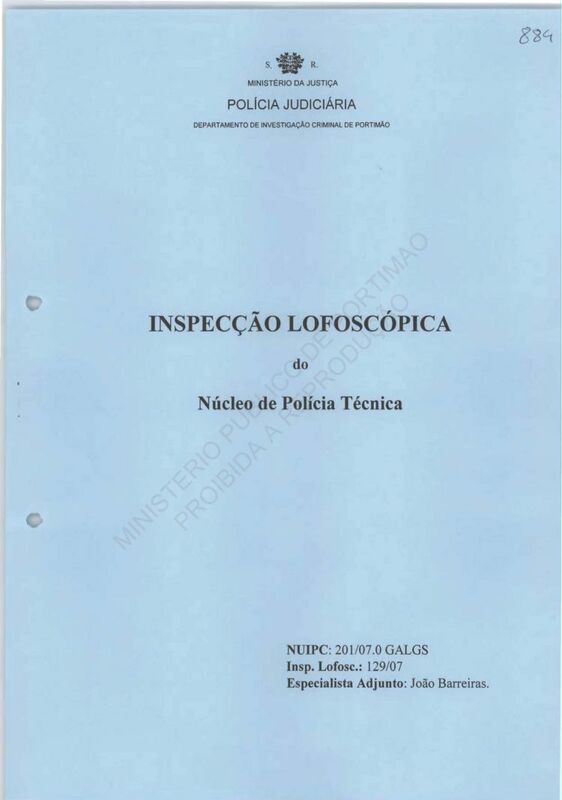 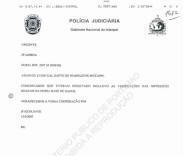 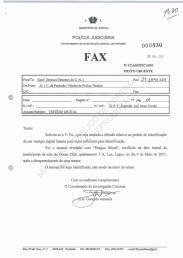 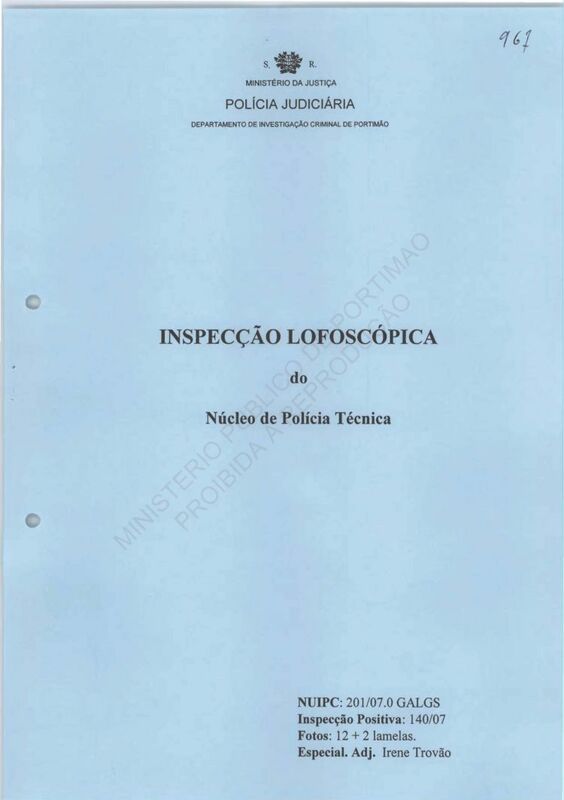 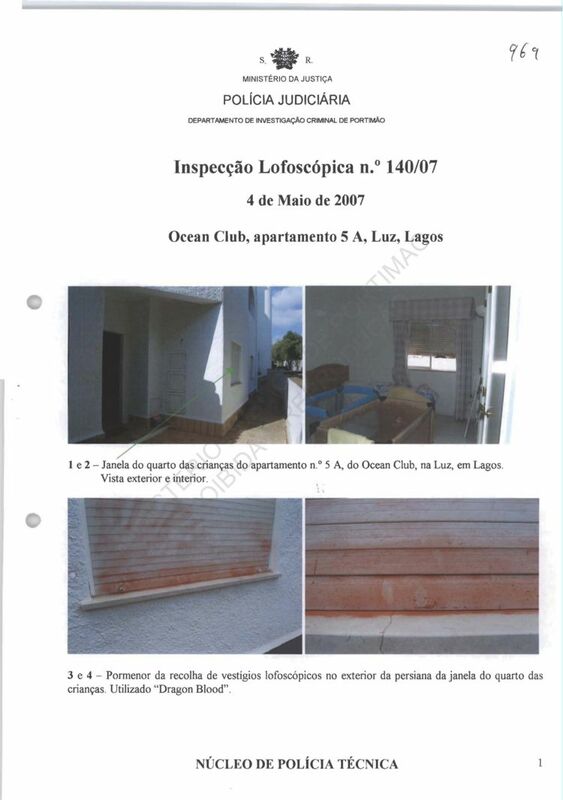 At 01 time on 04-05-07, I , Joao Barreiras, Assistant Specialist, proceeded to inspect the location described below. The fingerprint inspection was only carried out on the inside of the window because it was night time, the location was sealed and preserved so that light conditions would permit the inspection of the residence to be finalised. 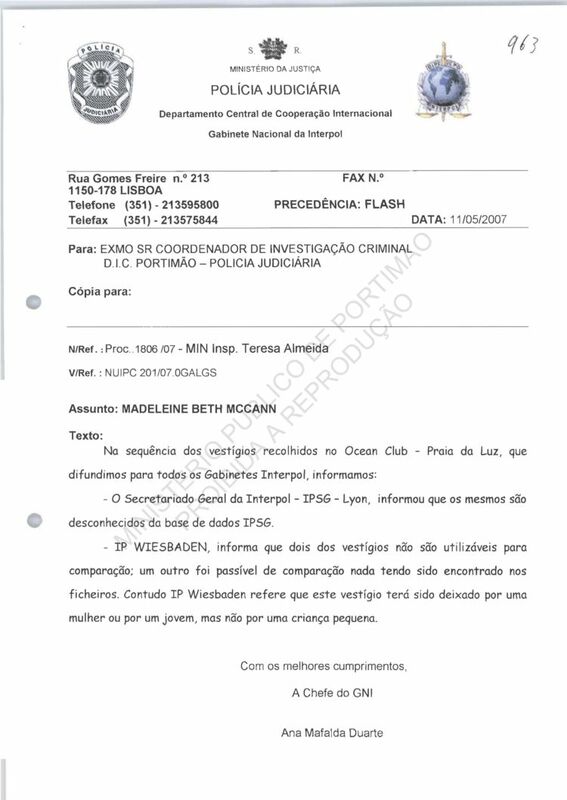 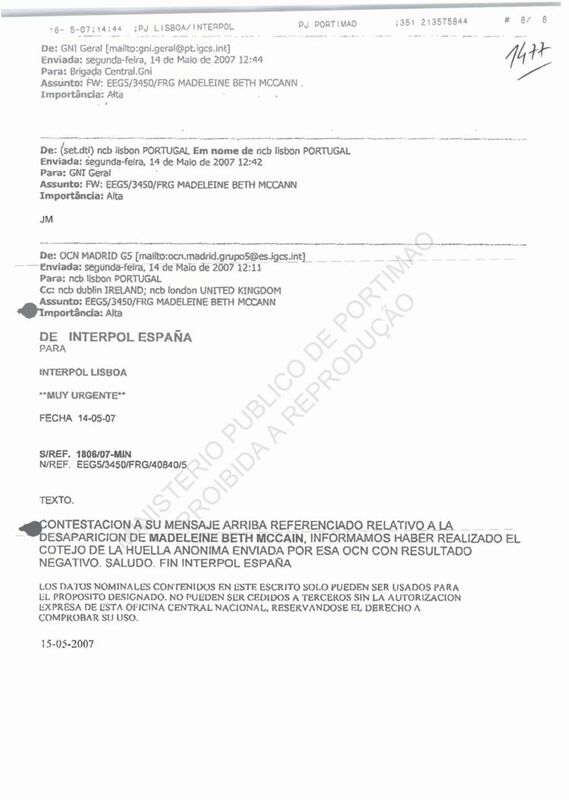 The Interpol General Secretariat Interpol, IPSG Lyon, has informed us that these samples are unknown in the IPSG database. 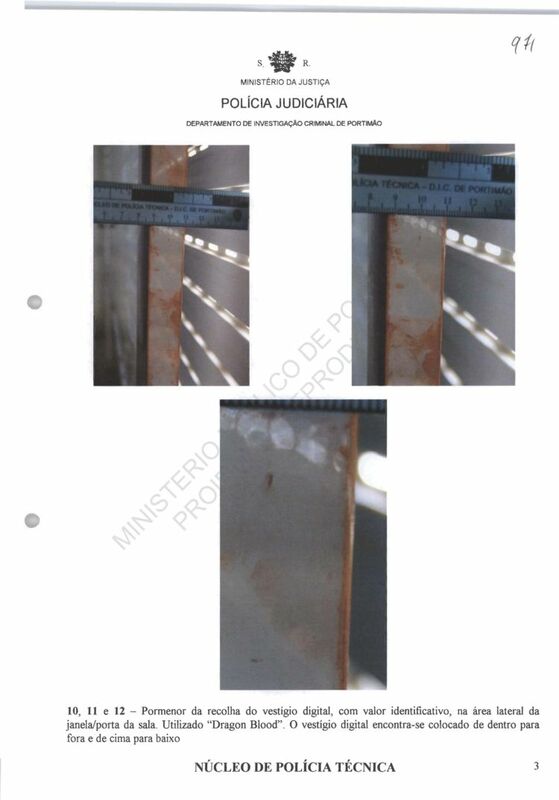 IP Wiesbaden informed us that two of the samples cannot be used for comparison, the other was possible for comparison, nothing being found in our files. However IP Wiesbaden states that this sample could have been left by a woman or a youth, but not by a small girl. 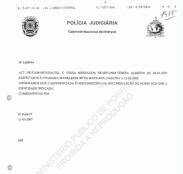 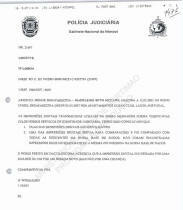 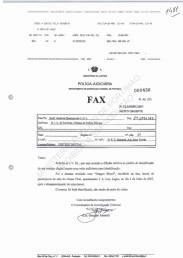 B - Pages 967-972 Processo vol 4. 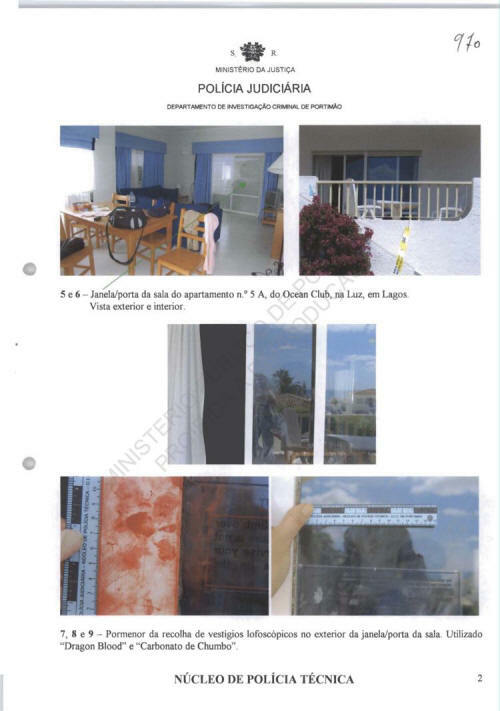 - Side of the patio door: One adequate print recovered but not matched to known persons. 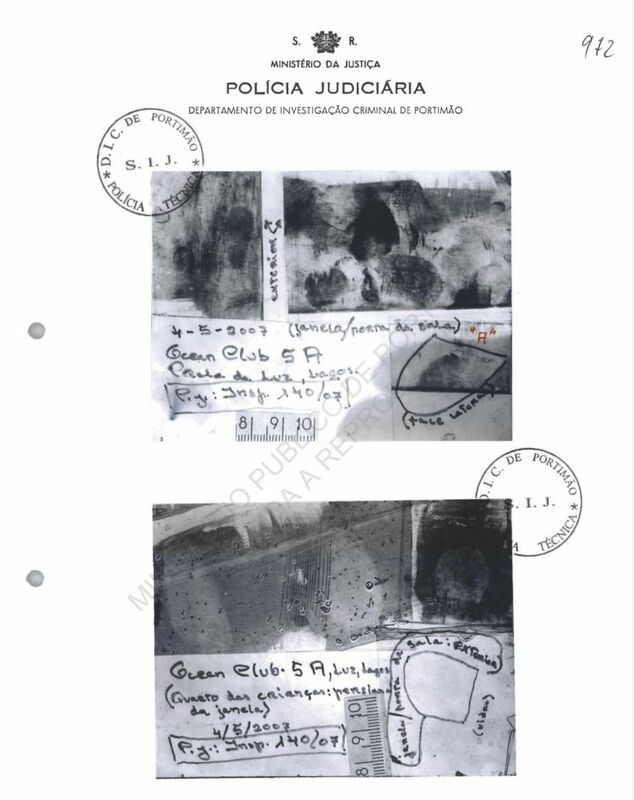 - Outside of one patio door: Eight inadequate prints were recovered.- Outside of [the other] patio door: One inadequate print was recovered.- Outside of the external blinds to the children's bedroom: three inadequate prints were recovered. 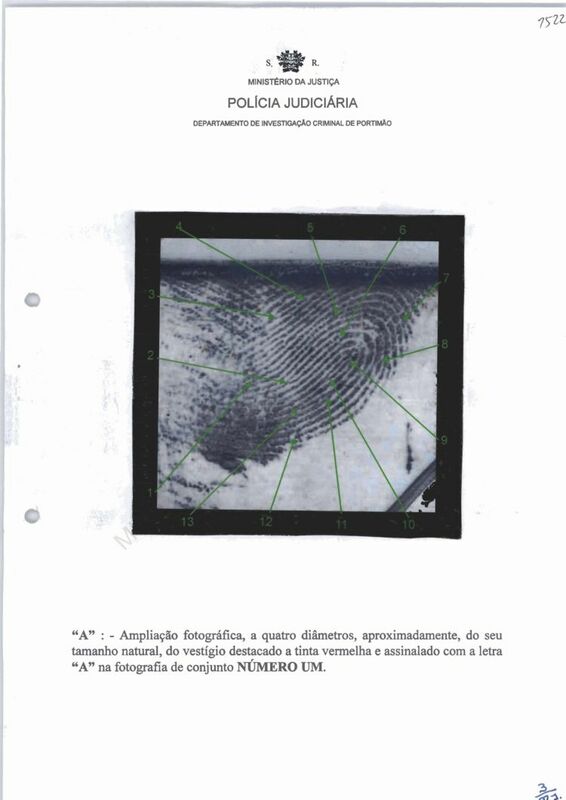 Several prints were unusable for comparison purposes; all others were compared with no results. 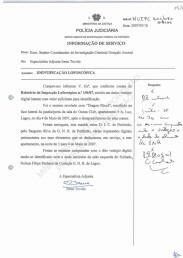 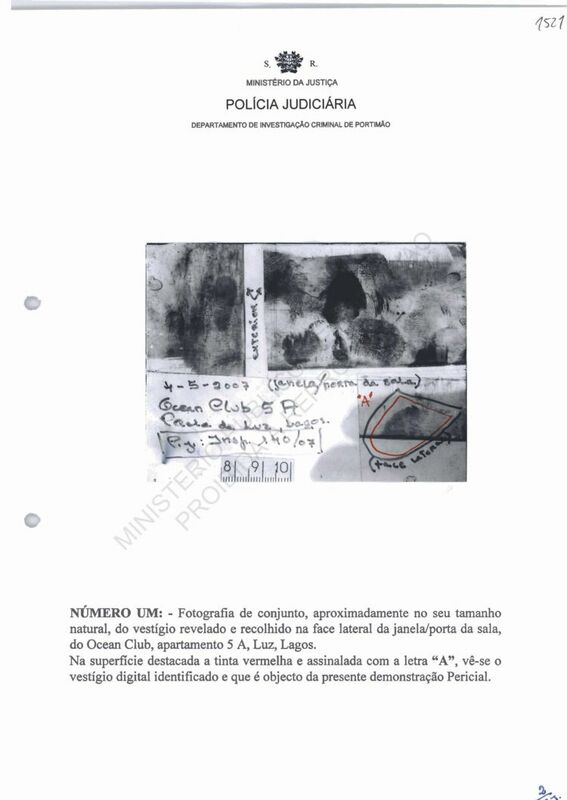 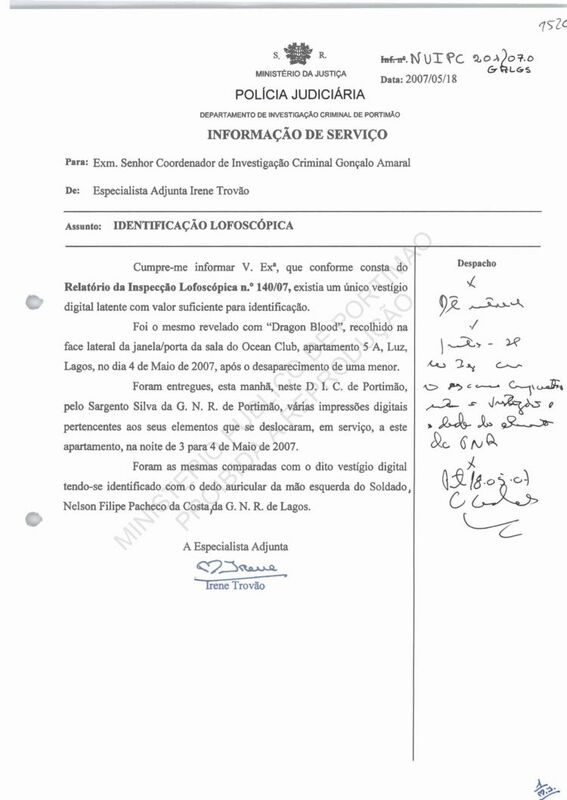 Request dated 18 May 2007 to stop requests to other countries regarding the fingerprints. 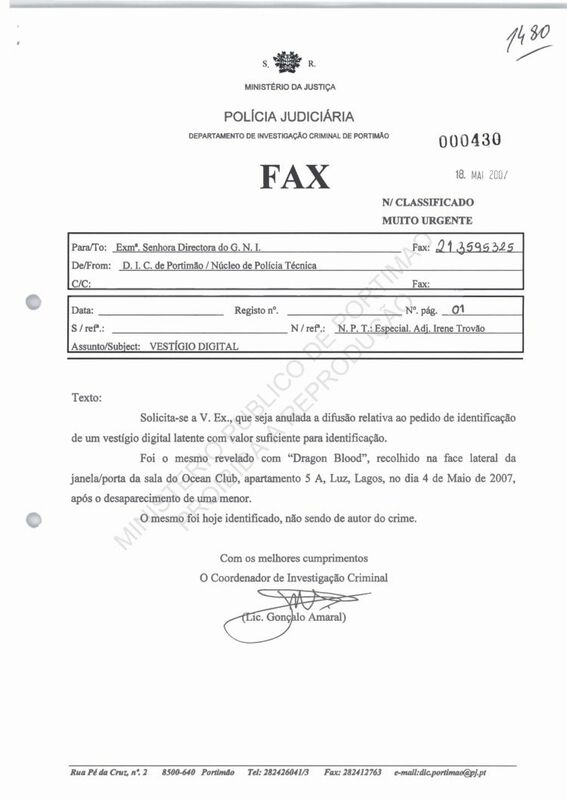 An owner had been identified and was not the perpetrator of any crime in apartment 5A on 3 May. 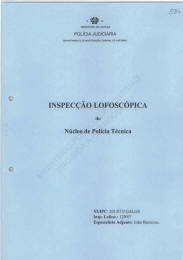 C - Pages 1470-07, 1498 Processo vol 6. 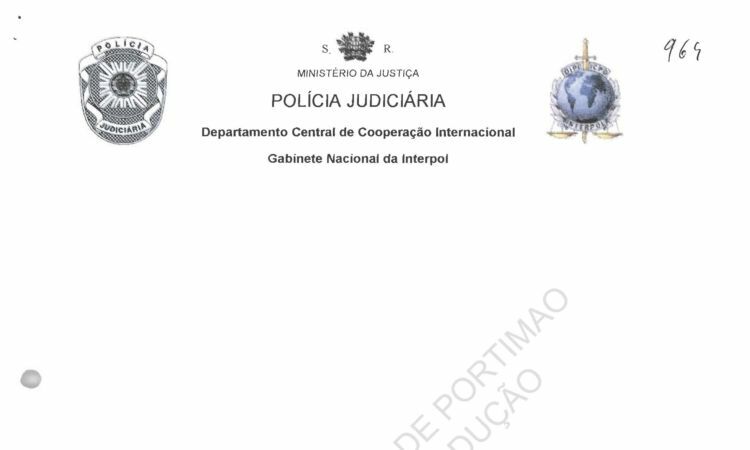 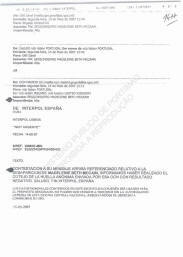 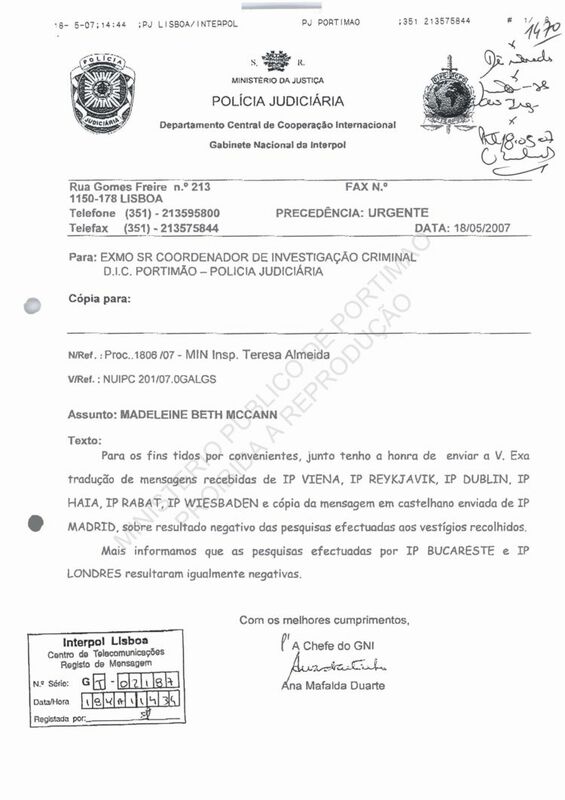 Various Interpol communications from police in eight countries around the world re: comparison of fingerprints with those retained in the databases of those countries. 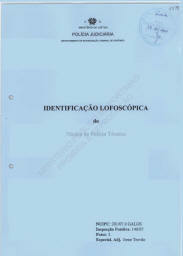 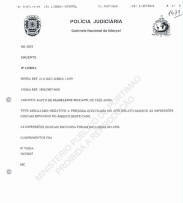 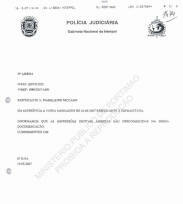 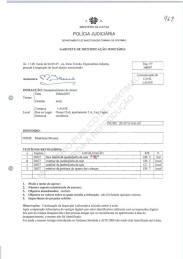 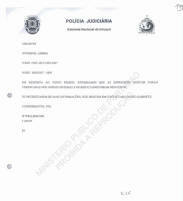 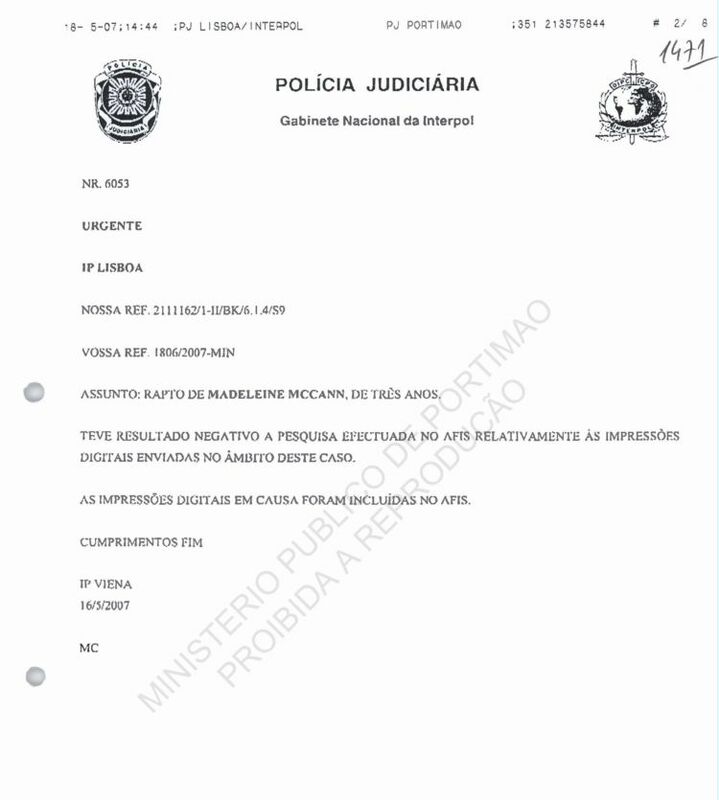 I inform you that according to report nº 140/07 there is a single finger print with sufficient value for identification. It was revealed with Dragon Blood and gathered from the side of the living room window/door of Ocean Club apartment 5 A on 4th May 2007 after the disappearance of the child. 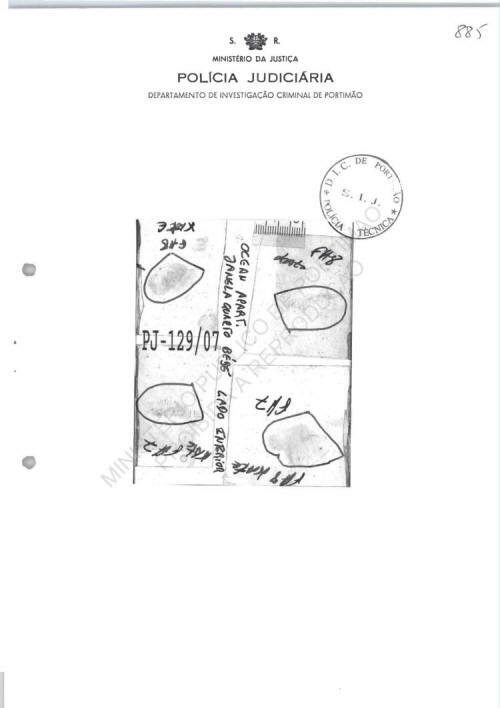 This morning Officer Silva delivered various fingerprints belonging to his officers who were on duty at the apartment on the night of 3 â€“ 4 May 2007. 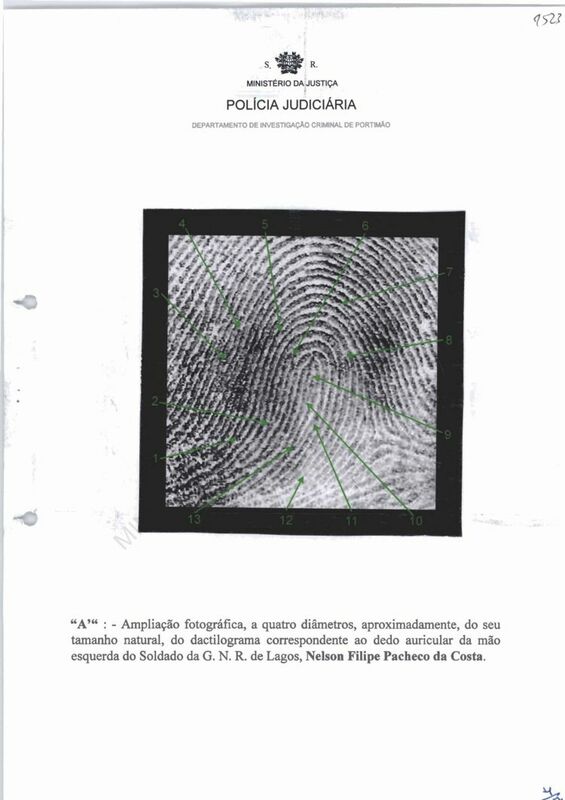 These were compared to the finger print which was identified as being that of Nelson Filipe Pacheco da Costa of the Lagos GNR.